A powerful customer experience platform, Oracle CX is designed to help companies leverage technology to cut costs, increase earnings and beat the competition. It helps drive innovation by using artificial intelligence and make the use of technology much simpler for companies so that they could keep on innovating and subsequently surpass the expectations of their clientele. With Oracle CX, businesses can cover all customer information all throughout the customer journey. This capability gives users ready access to critical customer data that maybe used to come up with data-driven actions to improve customer experience. The platform also helps users gain greater insights with its use of technologies that include chatbots, Internet of Things and AI. To make things even better, the solution has the ability to provide omnichannel customer experiences in areas such as sales, marketing, commerce and service, regardless where and when customer engagement begins. Oracle is known for having a vast collection of powerful customer experience apps. It offers businesses the flexibility to implement any single system and still be able to leverage technology to come up with the perfect customer experience. Oracle CX makes use of the finest dataset there is, making it capable of integrating data and using identity solution technology to come up with accurate customer profiles. Customer records generated by the system can be used to further enrich customer experience throughout their journey–from awareness to purchase to support and beyond. Oracle CX is designed to grow as your business does and can deliver both accuracy and speed, with data activated at a moment’s notice. The vendor has data centers that are equipped with the latest hardware, allowing the system to have total control over all information. Such has always been the way the company took control of data, enabling it to take an alternative but smarter way to manage customer experience. Oracle CX has the capability to connect customer experience applications with business systems like SCM and ERP, allowing users to better focus on their clientele. This is part of the vendor’s drive to address the growing trend of connected customer enterprise. This way, businesses get to have a fully integrated system that addresses customer experience management and critical business processes at the same time. The platform has an uncanny way of resolving marketing complications and adapting to changes in customer information. It makes use of adaptive intelligence to accomplish these, resulting in far better business outcomes. If you are considering Oracle CX it may also be sensible to examine other subcategories of Best Customer Experience Management Software gathered in our base of B2B software reviews. There are trendy and widely used systems in each software category. But are they essentially the best fit for your company’s unique needs? A popular software application may have thousands of subscribers, but does it present what you require? For this reason, do not blindly spend on popular systems. Read at least a few Oracle CX reviews and mull over the elements that you desire in the software such as the fees, main features, available integrations etc. Then, shortlist a few systems that fit your needs. Try out the free trials of these apps, read online opinions, get explanations from the seller, and do your homework systematically. This profound research is sure to help you find the best software platform for your firm’s unique needs. How Much Does Oracle CX Cost? We realize that when you make a decision to buy Customer Experience Management Software it’s important not only to see how experts evaluate it in their reviews, but also to find out if the real people and companies that buy it are actually satisfied with the product. That’s why we’ve created our behavior-based Customer Satisfaction Algorithm™ that gathers customer reviews, comments and Oracle CX reviews across a wide range of social media sites. The data is then presented in an easy to digest form showing how many people had positive and negative experience with Oracle CX. With that information at hand you should be equipped to make an informed buying decision that you won’t regret. What are Oracle CX pricing details? 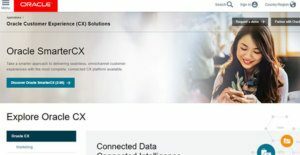 What integrations are available for Oracle CX?